Please select the following link to read all the Best Picture winners reviews. How extraordinary that a silent film has become all the rage in the motion-capture, Computer Generated Imagery, 3-D obsessed movie world we find ourselves in. Such is the case with The Artist, a film that dares to be innovative by being thoroughly retro. Maybe this really is a case of 'everything old is new again', but when one watches The Artist, it's clear from the get-go that this is not a gimmick. 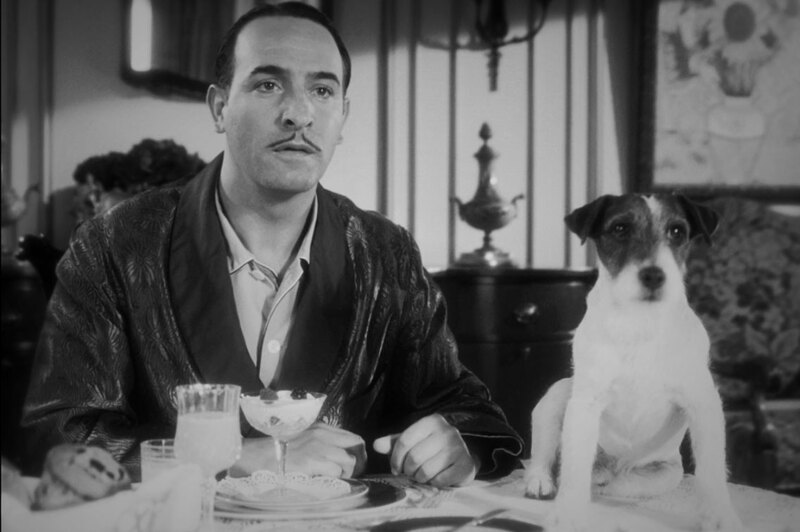 The Artist is a genuine, bona fide, silent feature with a few moments of sound, but I'll get back to that in a moment. 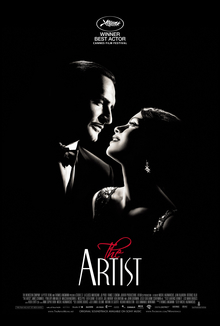 The best way to sum up the plot of The Artist is to say it's a mix of Singin' In the Rain with A Star Is Born, with a little bit of Sunset Boulevard. George Valentine (Jean Dujardin) is a big-time silent film star in the Douglas Fairbanks, Sr. mode: action and daring-do. At the premiere of his newest film, A Russian Affair, a fan literally bumps up to him with photographers watching. This fan is Peppy Miller (Bérénice Bejo), an aspiring actress herself. The photographers have a field day with the 'mystery girl', with the only one displeased being Mrs. Valentine, Doris (Penelope Ann Miller). In rapid succession, Peppy and George share an attraction while filming A German Affair, but he's married and she yearns to be a star. Well, we get to 1929, a bad year for Valentine; not only do we have the Wall Street crash that ruins him but even worse, sound is introduced into cinema. Studio boss Al Zimmer (John Goodman) will convert all his productions to sound, but George will have none of it: he's a silent film star and a silent film star he will remain. To prove the public still wants him without speaking, he produces and directs his own film, Tears of Love. It is set to premiere the same night as Peppy's new sound film, Beauty Spot. While Peppy rises, George falls, with only his driver Clifton (James Cromwell) loyal to him, as well as George's dog (billed simply as The Dog). As 1929 gives way to 193, then 1932, we see just how different our peppy Peppy and our valentine George have gone or not gone. Peppy's still the toast of Hollywood, while George is living some vaguely Norma Desmond-like life in his small room, watching his old films, knowing there is no future for him. In a drunken rage, he burns the prints of his films but is overcome by the smoke and flames, only to be rescued by The Dog. 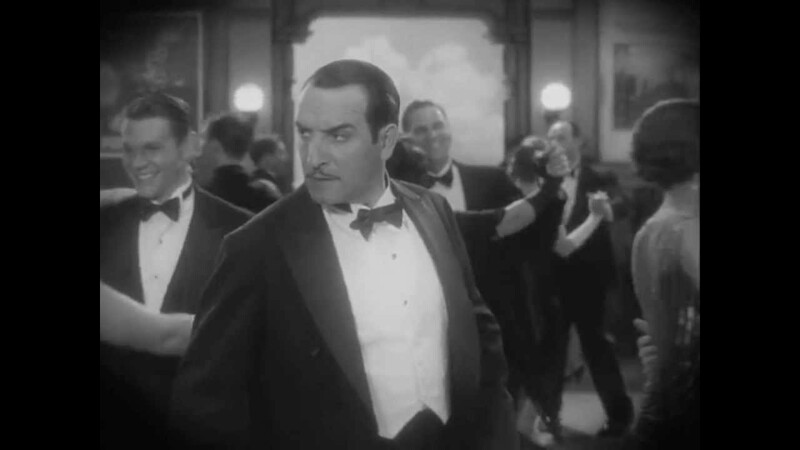 Peppy, learning of his plight, rushes to him, pushes Zimmer to give the John Gilbert-like George Valentine one last shot. George, too proud to beg, nearly ends it all, but then Peppy comes up with the perfect plan to save Valentine's career, and with that, The Artist George finally breaks the sound barrier to say his first lines, "With pleasure", in a lovely but light French accent. When I say George says his first lines, I don't want people to think these are the first spoken words in The Artist. It's not even the first sounds that are heard in the film. The Artist is, strictly speaking, not an all-silent film. There are moments when we do have sound. I counted a total of three, and each of these moments used sound to the best effect. In particular was the first time, when George is surprised to actually 'hear' the sound of a glass being put down on his dresser, followed by falling pens, laughing chorus girls, to be concluded with a feather as a bomb. The entire scene was almost Felliniesque in its brilliant use of sound in a silent film. The careful use of sound in The Artist doesn't distract from the viewing pleasure of watching the film. Actually, it only heightens the cleverness of the story. George Valentine, the character, won't speak, period. His world is quite literally a silent one. We begin the film with a scene from A Russian Affair, and the first words we read are, "I won't talk! I won't say a word!" When Doris reproaches him for not speaking to her, she 'says', "We have to talk, George". Seeing him silent, she 'screams', "Why do you refuse to talk?" Every time the subject of talking is brought up to George, he steadfastly maintains his silence. Michel Havanavicius' screenplay manages to put George's silences both in context and make it symbolic of what is going on in his life. Havanavicius' directing also shows a particular cleverness with metaphors. Early in The Artist, we see George and Peppy on the staircase: Peppy is going up, George is going down. He also has several brilliant hints from other films. For example, we can see the influence of Citizen Kane when we see the montage of the Valentine's crumbling marriage at breakfast, and when Peppy tells her friend, "I want to be alone", we can hear the great Garbo from Grand Hotel. The main influence in The Artist is Singin' in the Rain; shooting the faux A German Affair, all I could think of was the line Donald O'Connor told Gene Kelly about simply releasing the previous film under a new title: you've seen one, you've seen them all. At another point, the premiere of A Russian Affair is almost the same as the premiere of The Royal Rascal from Singin' in the Rain, right down to the shrewish Lina Lamont-type infuriated Valentine gave more stage time to his dog than to her. However, as I've stated, there is also a strong element of A Star Is Born: up-and-coming ingenue rises while former matinee idol goes down to near-defeat except the romance is not doomed. Finally, it the "Hollywood easily dismisses and throws out all silent film stars" and in Valentine's semi-reclusive world, we can see how Sunset Boulevard is being hinted at in The Artist. One thing I will fault The Artist for is the idea that silent films were almost immediately rejected by the studios and the public as soon as sound came in. One should remember that The Jazz Singer, which heralded the beginning of the end of silent films, was not, strictly speaking, an all-sound film. The first Best Picture winner was a silent film (Wings), and another silent film, Sunrise was also a big hit the same year as The Jazz Singer. Garbo didn't make her sound debut until 1930 in Anna Christie, and Charlie Chaplin continued making virtually silent films until the late 1930's. What I hope The Artist will do is finally put to rest once and for all the idea that silent film acting is broad to the point of farce. Granted, some silent film acting today can be seen as over-the-top, but some acting today is also over-the-top, and some silent film actors (Garbo, Pickford for example) have incredible subtlety. With The Artist, you see that the acting is beautiful, tender, and able to register so much with just their faces. Dujardin has the looks of a Fairbanks, Sr., and in the early part of the film we see just how much fun it must have been to be George Valentine. When called to bring drama, even pathos, to his character, Dujardin conveys it without being big on screen. His sadness is matched by Bejo's peppy Peppy, all jolly frivolity for the most part. We can see the joy she has when performing with the dance numbers between them a delight. The ability to communicate so much with just the eyes, the face, the body moments is also shown in the smaller parts by Goodman, Cromwell, Miller (a shamefully underused actress in my view), and even Malcolm McDowall in what I took to be a cameo. Music is vital in a silent film, and Ludovic Bource's score for The Artist communicates so much, from the coming of jazz to the seriousness of coming to the end of one's rope. While listening to the music, I thought I heard echoes of the score to Sunset Boulevard in the opening. While this may be my imagination given the subject matter, there is a clear use of the Love Theme from Vertigo at the end of the film, and I'm torn as to whether this was a good thing or not. It also has me fiercely debating whether one should consider The Artist's score to be original if it uses previously released music, especially if it takes it out of context. However, I will acknowledge the use of Pennies From Heaven (one of the few times voices are heard in The Artist) was well done within the film. Guillaume Schiffman's cinematography captured so beautifully the look of an early 20th century silent film that it could have been straight from a D.W. Griffith film. Why the use of Bernard Herrmann's score to Vertigo upset me so much I can't quite explain. Why I think ending The Artist with Dujardin speaking was wrong (thus making his French accent noticeable when one would have expected him to be North American given there was no suggestion he was anything other than American or Canadian) I can't quite explain either. Still, one can see from The Artist that silent films are just as good , if not better, than some sound films. If anything, I can only hope that The Artist will make the general public at least more receptive to silent films.